Martin H. Simon/GettyGary Cohn, chief economic advisor to the president (right) chats with Office of Management and Budget Director Mick Mulvaney in the Indian Treaty Room of the Eisenhower Executive Office Building on October 17, 2017 in Washington, DC. Mick Mulvaney, the director of the White House Office of Management and Budget, lavished praise on President Donald Trump’s top economic adviser Gary Cohn after Cohn announced his resignation Tuesday. In his statement, Mulvaney also took a dig at Cohn, referring to him as a “globalist,” a term often used to criticise someone who advocates for internationally focused economic policies. The term is also sometimes used with anti-Semitic undertones in far-right circles. 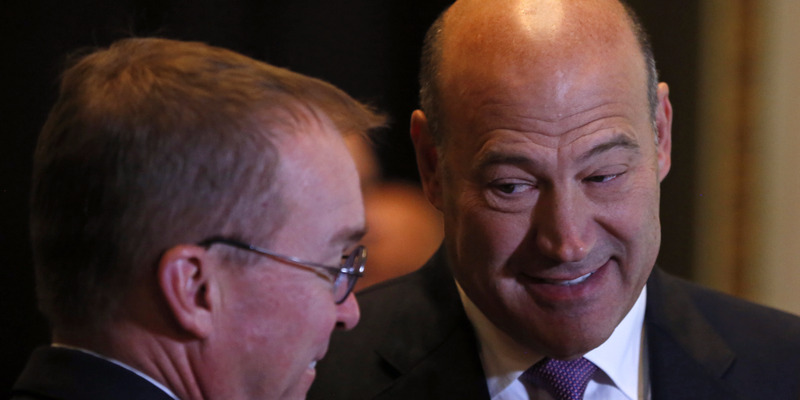 Cohn resigned from his post as the director of the National Economic Council amid Trump’s plans to institute tariffs on steel and aluminium imports. The top US budget official managed to simultaneously praise and criticise his former colleague, White House economic adviser Gary Cohn, all in one statement after Cohn resigned from his post on Tuesday. “As a right-wing conservative and founding member of the Freedom Caucus, I never expected that the coworker I would work closest, and best, with at the White House would be a ‘globalist,'” Mick Mulvaney, the director of the Office of Management and Budget,said in a statement. “Globalist” is often used as a derogatory term by opponents of free trade and internationally focused economic policies. In far-right circles, it often carries anti-Semitic undertones. Far-right news organisations like Breitbart, for example, have used globe emojis or “globalist” as a way to denote Jewish people, including Cohn. Cohn announced his resignation as director of the National Economic Council on Tuesday after an up-and-down year in the Trump administration that included public spats with the president and a large legislative success in passing the tax bill. President Donald Trump’s plans to institute wide-ranging tariffs on steel and aluminium imports into the US appeared to be the last straw for Cohn, who has long opposed such policy. The impending tariffs – 25% on steel and 10% on aluminium – have spurred fears of a global trade war, with countries around the world threatening to impose retaliatory measures. A day after Cohn’s exit, those fears kicked into overdrive as stocks around the world tumbled. Reports that at least some White House officials viewed Cohn as a globalist have been brewing for some time. Last September, amid simmering tensions between Cohn and Trump in the wake of Trump’s controversial comments on the violent protests in Charlottesville, Cohn was asked during an interview with CNBC whether the president ever called him a globalist.